Antares sells a variety of adapters/bushings to attach GSO-style Crayford focusers to many telescopes. It is a trivial matter to remove the base plate from a GSO focuser and insert the focuser into any one of the adapters below using a small allen key (not included). The telescope side of these adapters has three screw holes to attach the assembly to your telescope tube (except the SCT adapter). All adapters are machined out of aluminum and anodized black. 1. 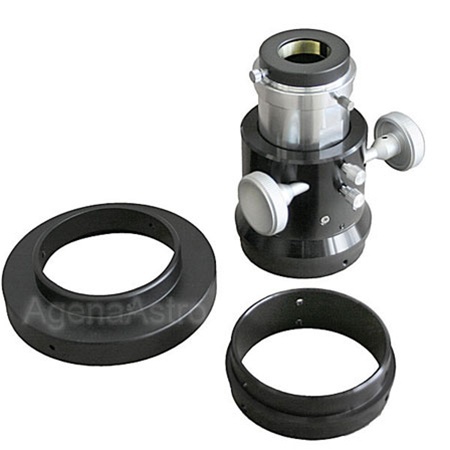 On the focuser/eyepiece side, all the above adapters have an inner diameter of 86.5mm (3.41"). These are designed to accept GSO's Crayford refractor focusers which have a flange outer diameter of 86.4mm (3.40"). These will not work with GSO's reflector or SCT focusers, or focusers from other brands. 2. The A102/120/150 adapters usually fit inside the telescope tube. 3. The J102/120/150 adapters usually fit outside the telescope tube. 4. These adapters will also fit many other telescopes and brands not listed above. However, to determine compatibility, please measure your telescope tube dimensions and use the above specification table to find which adapter will work for you. We are unable to recommend adapters for telescopes not listed above. Review by Bruno of Sydney Australia.